Three Control Systems in One. 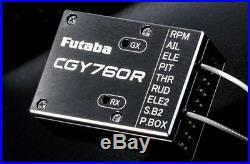 Futaba is proud to introduce the CGY760R, which combines a receiver, head speed governor and 3-axis heading-hold gyro into one complete unit. Perfect for flybarless helis, this convenient package is compatible with FASSTest and T-FHSS radios, along with S. Bus 2 system set-ups. It’s also compact, lightweight and low-profile for easy installation in virtually any heli. Receiver, head speed governor and 3-axis heading-hold gyro, all in one unit. Wireless parameter tuning through the Tx RF protocol. Based on the proven CGY750, winner of multiple flying contests. Low-profile design, small in size and light in weight. High-speed operation and extremely low latency. Compatible with analog and digital servos. Feed Forward option for more precise operation. Basic and Expert menus. Advanced, adaptive PID control loop. The item “Futaba CGY760R 3-Axis Gyro(FUTM0841)” is in sale since Thursday, October 11, 2018. This item is in the category “Toys & Hobbies\Radio Control & Control Line\RC Model Vehicle Parts & Accs\Control, Radio & Electronics\Flight Controllers & Gyros”. The seller is “kct_model” and is located in Kaohsiung. This item can be shipped worldwide.